[Review] MightyText for Android + Invitecode! 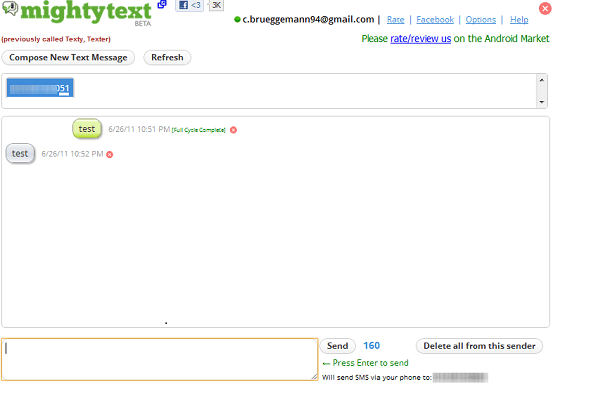 MightyText is a service that pushes text messages and phone calls to your PC. It allows you to reply to a text message sent to your phone via your PC, allowing you the opportunity to bypass your phone's tiny keyboard for the big one on your desk. I gave it a go and tried the service out. The installation is quite easy. You just need to install mightyText from the Android Market on your Android device, and the matching mightyText extension from the Google Chrome Webstore. After that, you need to authorize the app and the extension with Google, and then you're set. After the setup, you can click on the extension in Google Chrome, right by the settings button. In case there are multiple threads, there are multiple blue tabs, not just one. If the number of the sender is known, mightyText will show the contact's name instead of their number. I tried sending a few text messages via the service, and it worked flawlessly. If you get a text message or a phone call, you'll get a notification on your PC almost instantly. The developers of the service plan to support importing your text messages from the phone. So far, the Chrome add-on only shows the text messages you've received after setting up the service. If this review made you interested in trying the service out, feel free to sign up here with this invite code, in order to process your invitation request a lot faster: "ANDROIDPIT-MIGHTYTEXT". The code will expire after 1000 invitations - so be quick!